• Emily Kinney, interviewed by TVLine, says that Beth “started to become fearless, like, ‘I could die at any moment! Whatever!’ She would rather be the person she wants to be, strong and fighting for herself, then play the game. She didn’t have anything to lose.” Kinney also talks to Entertainment Weekly, Us Weekly, The Wall Street Journal, Access Hollywood and The Daily Beast. 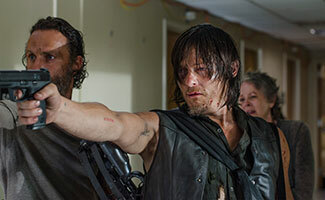 • The Walking Dead wins TV Guide Magazine‘s Fan Favorites Awards in the Favorite Horror Show category. • Scott Gimple tells USA Today that Beth’s demise was “devastating, crushing. It was painful and will be painful for these people for some time.” Gimple gives some more insight, including a little detail about Morgan, to Variety, The Hollywood Reporter, Vulture, Entertainment Weekly, Deadline, The Daily Beast and TV Guide. • Cinema Blend relives the show’s most “gut-wrenching” moments, from Andrea losing Amy to Lizzie looking at the flowers. • The Tennessean notes the appearance of Goo Goo Cluster on the midseason finale and talks to the Nashville-based maker of the candy. • Catch Norman Reedus in a commercial for Apple’s new Beats Solo2 headphones at BGR. • For recaps and reviews of the Season 5 mid-season finale, “Coda,” check out The Atlantic, Big Shiny Robot, CBS News, The Daily Beast, Den of Geek, Entertainment Weekly, Forbes, The Hollywood Reporter, The Huffington Post, Los Angeles Times, Rolling Stone, USA Today, Variety, Vulture and Yahoo TV.